If you want to work on honing your skills before the start of deer season, this lifelike target might be exactly what you need. Its realistic appearance and marked vitals will help you improve aim and accuracy, and you will also appreciate its durable construction. Designed to last through repeated arrow hits and with a large shooting surface, this 3D target will ensure that you are ready to bag the first buck of the season. While the Glendel Pre Rut Buck target is designed to be durable and weather resistant, it should not be left outside when it is not being used. While having to move it from the field to protective shelter can be inconvenient, it will help prolong the life of this target. One of the main advantages of this archery target is its lifelike appearance. The target is designed to mimic the weight and height of a 250 pound buck, so you can get in plenty of practice before deer season starts. Its 3D construction is also designed to help prepare you for the truly amazing size and appearance of a live buck. Once you know what to expect, it will be easier for you to take aim and make an accurate and humane killing shot. In order for you to truly prepare yourself for the actual hunt, you need to practice on a realistic and durable target. The Glendel Buck is designed to withstand repeated hits with field points without losing its shape, and you can replace the inserts for the vital organs if the foam starts to crumble. To add to the stability of the target the legs are hollow so you have the option of running a metal pipe through to keep it firmly planted in the ground. The large deer target is also resistant to the weather, but it is a good idea to keep it indoors when it is not being used. To truly improve your skills with a bow and arrow you need to have a target area that you can clearly see, and that is not a problem with this 3D deer. It is designed to have roughly the same body size as a 250 lb. pre rut buck, and comes with 4 large target areas for you to aim at. Each one corresponds to vital organs on the deer so you can easily make your shot the first time. With up to 7 times the shooting area as other lifelike targets, you can rest assured that you will be prepared when you see your first buck of the season. Beginners and professionals can all benefit from this 3D Glendel target. It is designed to have the same profile and body size as a large buck so you know exactly what to expect when the first big deer crosses your path. It comes with 4 targets so you know just where to aim for a killing shot, and it is strong enough to stop arrows traveling up to 390 feet per second. 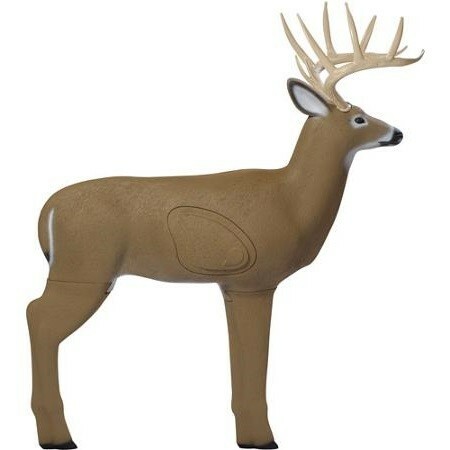 With large target areas and a durable construction, you will be more than ready for deer season to start after spending some time practicing with the Glendel Buck.